Kitchen Extension Success With Bishop Stortford Orangery. When the owners of of this 1930’s house decided to redo their kitchen, they took a radical approach. Like so many others, they wanted a contemporary space that would allow them to not only have a state of the art kitchen, but also room for casual daily dining. 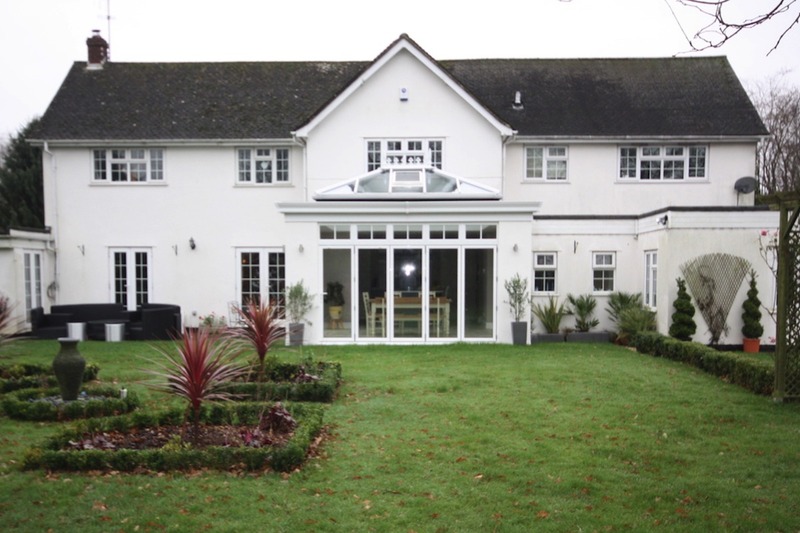 The classic styling of the home called for a classically styled extension that would compliment the architecture. Two previous additions had been added over the years and therefore this third extension needed to bring everything together in a unified way. The Cambridge Conservatory Centre designed a large Orangery that had white rendered piers on each corner and fitted folding doors between the solid structure on two sides and a window on the third. The large lantern roof with decorative finials soars above the white framework below and mirrors the striking gable above. 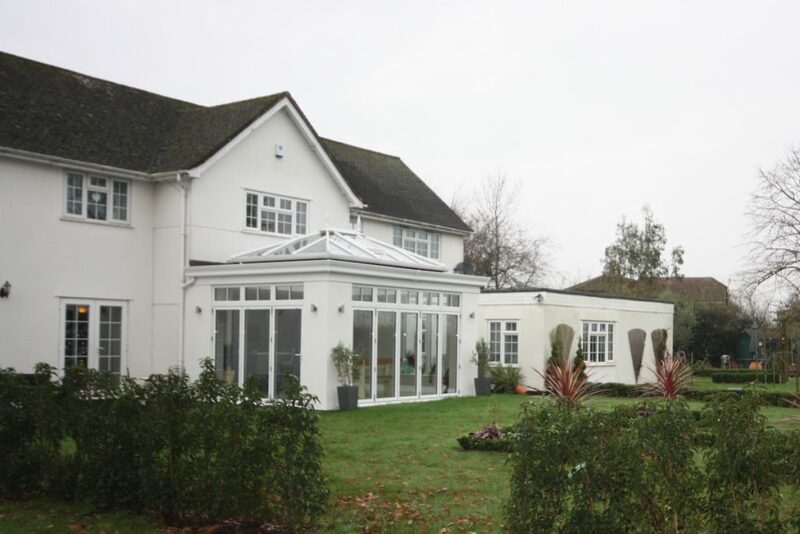 Choosing to colour the new Orangery to match the house makes it sit harmoniously in it’s surroundings and suggests a longevity that just feels right. The new open plan kitchen design including shaker profile doors and a very large island with central Butler’s sink gives a classic but very contemporary feel to the room. 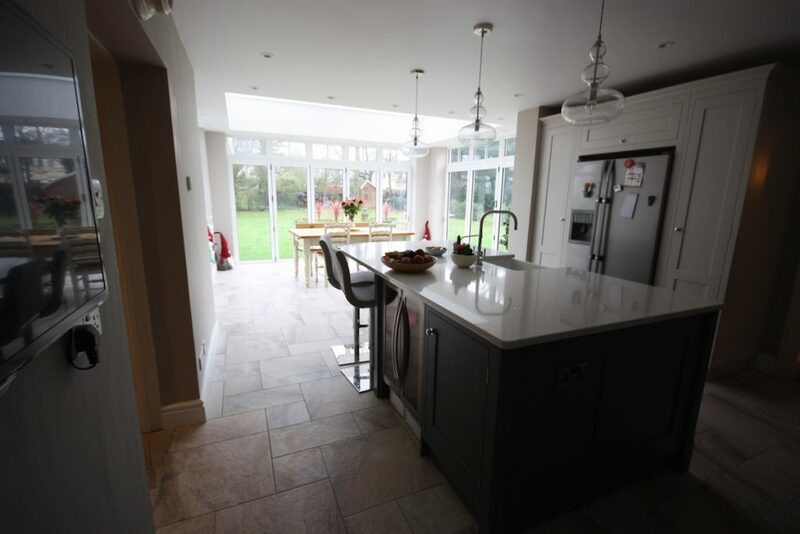 Two bar stools allow for the cook to enjoy conversation and company while preparing meals and the new dining room Orangery creates the perfect space to entertain. When the sun is shining, the two sets of folding doors can be opened to give direct access to the large garden. And on dull days, the light filled Orangery is like a magnet drawing the owners in to enjoy a meal and social time with friends. This brand new space is the perfect mix of traditional and contemporary. 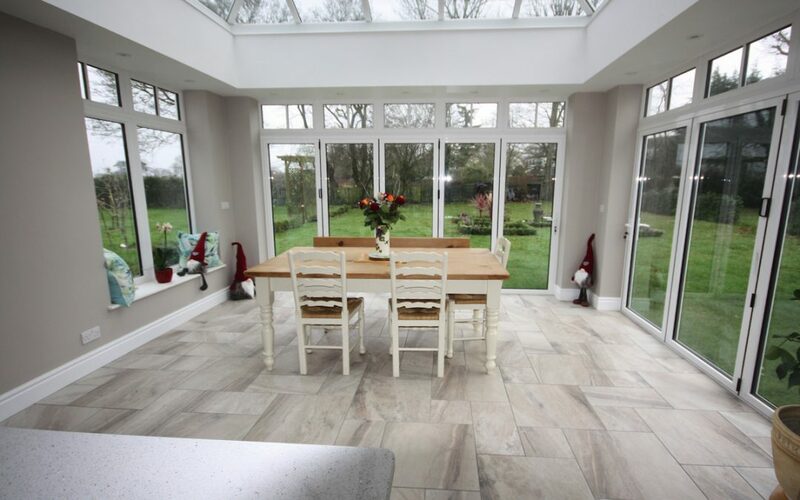 Who wouldn’t want to take a cuppa and a newspaper and while away several hours in this stunning light filled Bishop Stortford Orangery.